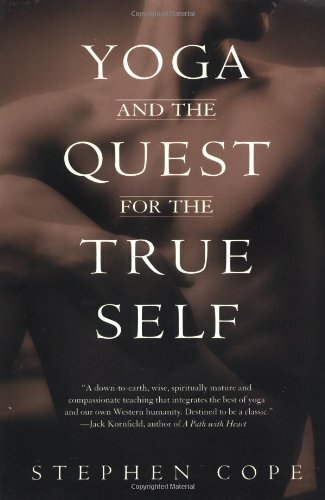 Yoga and the Quest for the True Self : Review — The Contemplative Life. In Yoga and the Quest for the True Self, Stephen Cope, a practicing psychologist, leads us through his journey into the world of yoga, especially as it relates to his experience with the Kripalu community in Massachusetts. Along the way, the reader is clearly introduced to core concepts in yoga psychology. Overview: The book is broken into five parts – The Discovery of the Royal Secret, The Self in Exile, Encounters with the Mother and the Seer, The Spontaneous Wisdom of the Body, and The Royal Road Home. I'll take a look at the first two sections. An inchoate sense of something unimaginable about to be born out of the disorganization of (their) lives"
Cope, drawing on his study of Carl Jung, believes that in the second half of life human beings long to draw inward and find the very center of themselves, and that this is inextricably bound with the search for God. Cope sets out to find his deepest self, and God, through the practice of yoga. "When we begin to see clearly who we really are, according to this view, we feel a natural friendliness toward all beings. Beneath the surface of separation, we feel the hidden, unseen threads that link us. We know that we're exactly alike inside. We're the same being. As author John Welch says, 'We are each like a well that has a source in a common underground stream which supplies all. The deeper down I go, the closer I come to the source which puts me in contact with all other life." The section ends with Cope questioning how this view of the self plays out in day to day life as he explores the yogic concepts of Brahman and Shakti. The Self in Exile: In Section II, The Self in Exile, Cope further relates his experience in the Kripalu community and explores the concept of the "true self" vs. the "false self." He believes, along with many from the yogic tradition, that the major problem that humanity faces is that of misidentification. We choose to identify ourselves with the small, or false, self. Our ego, our persona, becomes our identity. So not only do we have jobs, we are our jobs. Not only do we have relationships we are our relationships. Not only do we have likes and dislikes, we are our likes and dislikes. We create an identity for ourselves from elements of our personality and call it "me." The alternative is to identify with the Atman, our true or deepest self, which is continuous with Brahman, the source of existence. Cope believes that yoga is a way to find and experience this reality, our True Selves. The rest of the book mostly contains stories of various yogis and how the practice has changed their lives. Reflections: I really, really resonate with the first half of this book. Both Cope's personal story of his need to depart on a spiritual quest and his clear breakdown of yogic metaphysical thought are major strengths of the book. I underlined more in the first two sections of this book than I have in any other recent read. But...the second half just felt forced. His discussions about other yogic concepts became overly complex and the anecdotes from other yogis just didn't seem all that helpful to me. I felt the book could have been half as long. Like the spiritual warrior that he was, Jeff had dived into the vipassana meditation technique with what the Buddha called 'strong determination.' Following instructions, Jeff had done sitting and walking meditation for thirteen hours a day, watching his thoughts, following his breath, paying attention to a subtle new inner landscape of sensations in his body. Not surprisingly, waves of thought and feelings that he ordinarily kept out of awareness began to come into view. At first this was fascinating to him. He wanted more. He stayed later at night in the meditation hall than anyone else. This was magic. Soon, however, the insights became overwhelming. Yet once he had begun to open up the process, he wasn't sure how to shut it down again...When insight moves too quickly to uncover painful aspects of mental and emotional life, the personality becomes disorganized and fragmented. Under these conditions, there can be a sense of disorientation, a deterioration in cognitive functioning, and an experience of depersonalization and dissociation." I've written about this before, in the sense that I don't see talk of emotional turmoil much in books on meditation practice. It is well acknowledged in the Centering Prayer movement, and what Jeff describes above might be spoken of in terms of "The Divine Therapy" there, but it is rare to find this subject addressed in other traditions. It is always helpful to know that this is part of most spiritual paths. Another takeaway for me is a connection to my own yoga practice. I'm not sure I agree with all the claims of how hatha (physical posture) yoga can lead to spiritual discovery, but I do find it a very helpful aid to my meditation practice. Just as in my Centering Prayer practice, I "notice the thought, return to an openness to God," in yoga I "notice the thought, return to the sensations of the body." I feel that this helps me discipline my mind in preparation for meditation. Overall, this book is a really good intro to Yoga psychology, from a trained psychologist, in narrative form. In my opinion, it does get a little fragmented towards the end, but that doesn't take away from the value of the read.